It’s great once you’ve decided that you would like to let more natural light into your property with a rooflight of some sort, however, it is not always easy to choose between skylights and lantern rooflights. Lantern rooflights are the larger, more prestigious-looking glass roof window options, while skylights are generally smaller, high-quality “windows” to install on your roof. Skylights can offer improved ventilation in the room they’re installed in, while roof lanterns tend to be fixed. Where is a skylight best placed in a property? Skylights and roof lanterns work well in many different rooms of a house. Your kitchen, for example, may benefit from an increased natural light level and further ventilation, while in the lounge there would be less need to open the roof window. In theory, there are no rules as to which room you should have a roof lantern installed in, it is a matter of personal choice. Many people opt for conservatories, kitchens, orangeries, sun rooms and dining rooms as their room of choice for a roof lantern, however, that is not to say you can’t have a roof lantern installed in whichever room you prefer. In most cases, planning permission will not be required, however, you should make sure this is not needed before going ahead with an installation. Just because you have a flat roof does not mean that you must opt for a roof lantern. In fact, a skylight may be better suited to both your budget and plans for your home. It is not true that only roof lanterns open up your home to allow the maximum amount of light in. In fact, skylights are equally effective in brightening up your home when installed in an area of direct sunlight. What’s more, they can let the fresh air in too! Ultimately, when choosing between roof lanterns and skylights, the choice is yours. There are plenty of skylight options from Prestige Roof Lanterns UK. 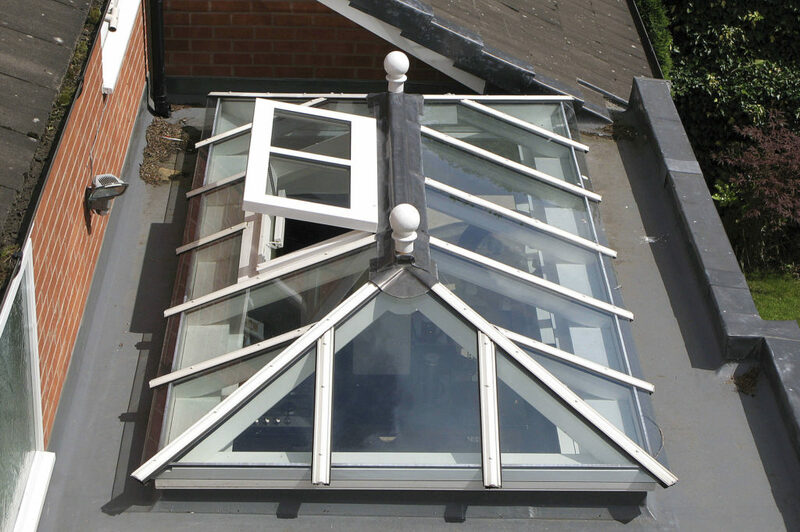 Choose from various different skylight sizes and openings, to suit your property entirely. Many homeowners do prefer to opt for a roof lantern over a skylight when they have a flat roof. However, some are deterred by the cost. If you have got your heart set on a roof lantern over a skylight, but not quite sure your budget can stretch to it, you may want to consider installing the roof lantern yourself. Read our guide on how to install a roof lantern on a flat roof for more information. If you would like to find out more about the pros and cons of having a flat roof, perhaps you are considering the roof for a new orangery installation or thinking about a roof replacement for an extension, read our article on advantages and disadvantages of flat roofs. For more information on any of our roof lanterns or skylights then please contact us at Prestige Roof Lanterns UK, we’re happy to help.